The T-155 155mm Panter [Panther] towed howitzer is a completely Turkish designed and manufactured 155 mm 52 caliber with 40 km Range howitzer that can be towed or can be self propelled. 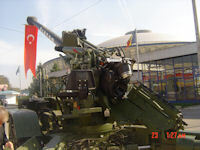 The Panter towed howitzer was developed in the 1990s to meet operational requirements of the Turkish Land Forces Command (TLFC). Following trials and modifications of prototype systems, the first production order was placed. 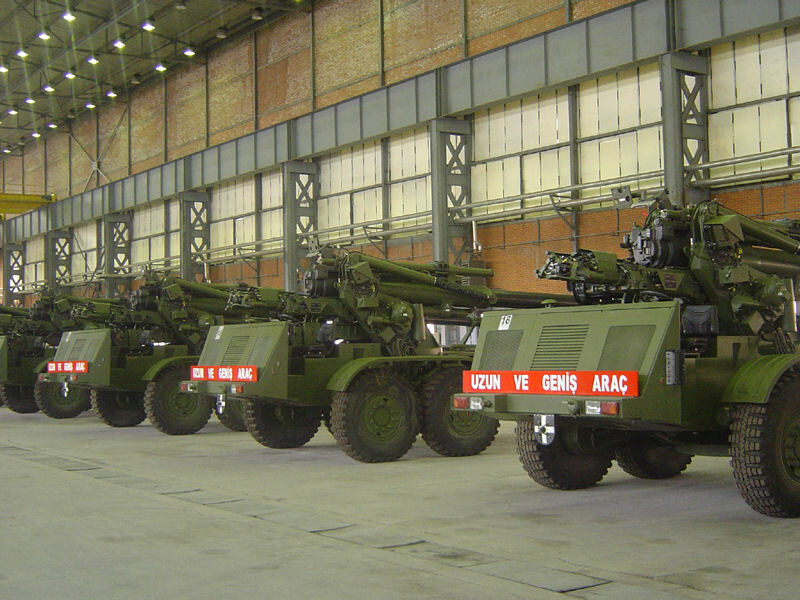 The first batch of six 155 mm/52 calibre Panter systems were completed in mid-2002, built at the Cankiri facilities of MKEK CANSAS. These were handed over to the 105th Artillery Regiment in Corlu with a ceremony held at the 1011th Ordnance factories in Ankara. The first production batch of 155 mm/52 calibre Panter consisted of 18 units, sufficient to equip one artillery regiment of three batteries each of six weapons. While Turkey had carried out extensive upgrades on old US supplied M44 (155 mm) and M52 (105 mm) self-propelled weapons, which had been fitted with a 155 mm/39 calibre barrel, the 155 mm/52 calibre Panter was the first complete artillery system to have been developed in Turkey. Some assistance during the development phase of the 155 mm/52 calibre Panter was provided by Singapore Technologies Kinetics, which had developed the FH2000 155 mm/52 calibre towed artillery system to meet the requirements of the Singapore Armed Forces. The new 155 mm/52 calibre Panter supplemented the current M114 towed howitzer, which only had a range of 14.6 km and fireed standard ammunition. The TLFC had a total of 517 M114s in service, but only part of this fleet would be replaced by the much more effective 155 mm/52 calibre Panter. The Turkish Land Forces Command also started to take delivery of the locally manufactured Firtina 155 mm/52 calibre self-propelled artillery system. This is essentially the Republic of Korea 155 mm/52 calibre K9 Thunder. The 155 mm/52 calibre Panter howitzer is mounted on a conventional split-trail carriage. When in the travelling position the 155 mm/52 calibre ordnance is traversed through 180° and locked in position over the closed trails. The travel lock is mounted on the right trail. An Auxiliary Power Unit (APU) is mounted on the forward part of the carriage, enabling the 155 mm/52 calibre Panter to propel itself at a maximum speed of 18 km/h. The APU includes a German DEUTZ air-cooled diesel developing 160 hp. When deployed in the firing position the weapon is supported on a circular baseplate mounted under the carriage and the two trails each of which is provided with a spade. When deployed in the firing position, the four main road wheels are raised clear of the ground. Each trail leg has a small wheel to assist in bringing the weapon into the firing position. These are also used in conjunction with the four main wheels when the weapon is being used in its self-propelled mode. The sighting system, as well as the laying equipment, is mounted on the left side where the seat for the layer is provided. The 155 mm/52 calibre Panter is used in conjunction with the new locally developed Aselsan BAIKS-2000 Field Artillery Battery Fire Direction system. This will improve response times as well as improving first round bit probability under a variety of weather conditions at all ranges. Pakistan bought 115 used M-109A5 155mm self-propelled howitzers under a $56 million deal with the US in 2006. 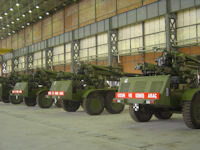 It had also locally manufactured Turkish MKEK Panter towed 155mm howitzers after getting 12 guns for evaluation in 2007. A ceremony was held 11 September 2007 at School of Artillery Nowshera in which Chief of Logistics Staff Turkish Armed Forces Lieutenant General Hulusi AKAR donated 155 mm Howitzer Panther Gun to Pakistan Army. Speaking on occasion Lieutenant General Hulusi AKAR said Pakistan and Turkey enjoy a very special relationship marked by a rich reserve of mutual good will and strong desire to further strengthen bilateral ties. Both brethren countries enjoy close relations in field of defence collaboration ranging from weapons and equipment training of each student officer in Pakistan and turkey and joint exercise being conducted. Turkey is a leading country in production of arms and this donation was a milestone in the history of both countries in further fostering brotherly relations. Lieutenant General Hulusi AKAR handed over the keys, of 155 mm Howitzer Panther Gun to Lieutenant General Ejaz Ahmed Bakhshi, Director General Weapons & Equipment. A memorandum of understanding between both countries was also signed to boost existing ties on defense production. 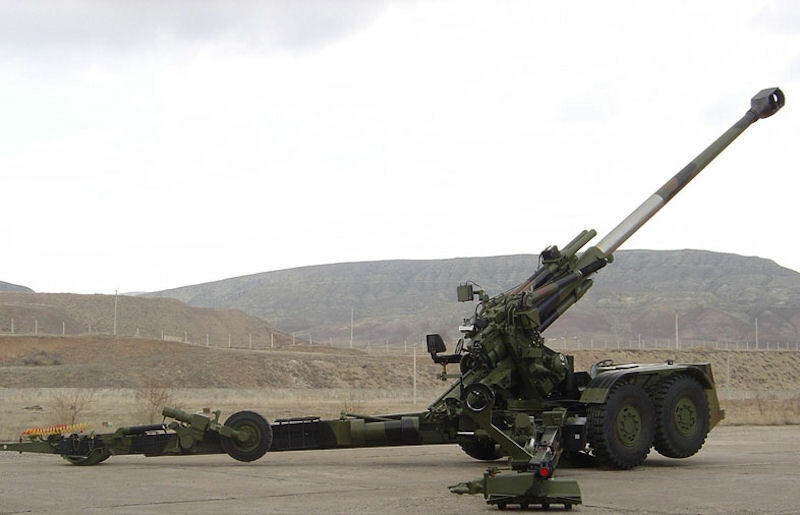 After a long spell of over two decades, the need for artillery upgrade in India was first felt in 2008, when the Indian defence ministry issued three global tenders for 155mm howitzers for the mountains, the plains and self-propelled guns for the deserts. By 2011 Pakistan was consolidating its howitzer inventory around the 155mm round and increasing its MRLS fleet to boost the lethality of its artillery against India. 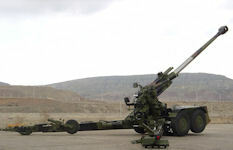 The Army had been modernizing its artillery in recent years as it planned to increase fully mechanized formations. There was no apocalyptic moment; it came about because of a normal reassessment of tactics and strategy consistent with the doctrine of 'hold and strike.' For rapid, if deliberately limited, advance, self propelled artillery is vital. The main acquisitions are at least 297 M-109A5 155mm self-propelled howitzers that have been supplied since 2007 under a $56 million deal made in 2006, and local production of the Turkish MKEK Panter towed 155mm howitzers, by Heavy Industries Taxila's Heavy Mechanical Complex, after 12 were delivered for evaluation in 2007. The 155mm Panter howitzer was a substantial improvement over existing guns. The combination of the Turkish Panter, with the American AN/TPQ-36 Firefinder and Chinese SLC-2 radars, as improving the accuracy of Pakistan's long-range artillery under a variety of weather conditions at all ranges. 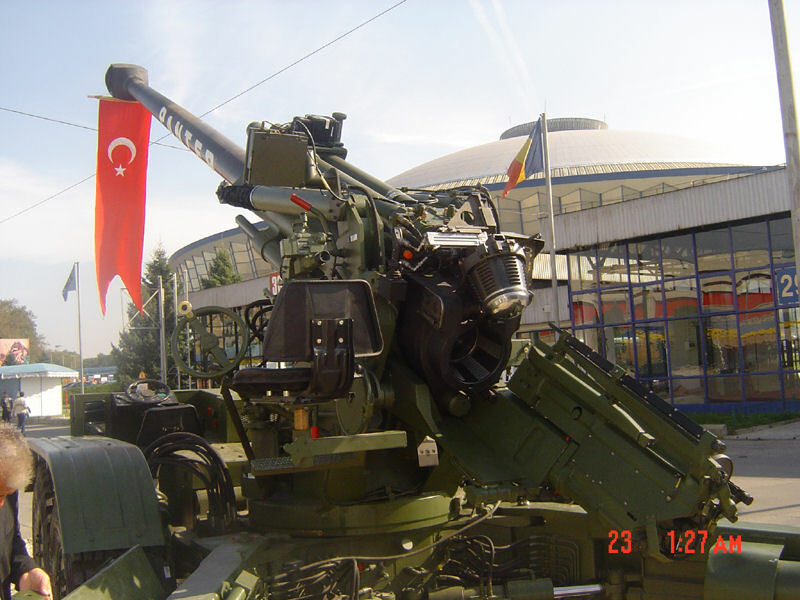 A mid-2008 deal with Nexter called for the production of 155mm artillery rounds, plus the acquisition of 10 Turkish artillery simulators, which began to enter service with the School of Artillery in 2008 in this regard. Impact: 3 rds in 15 sec.